We know that Dr. Evil’s father did not invent the question mark, but where did it actually come from? According to Lynne Truss (in Eats, Shoots & Leaves), it was the brainchild of Alcuin of York (d. 804), abbot of Tours and participant in the same Carolingian Renaissance that also gave us minuscules, spaces between words, and clear handwriting. Posted in History, Western Civ. 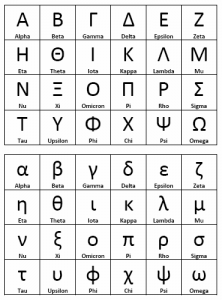 The standard theory is that it was borrowed from the Phoenicians c. 800 BC and adapted to the Greek language. 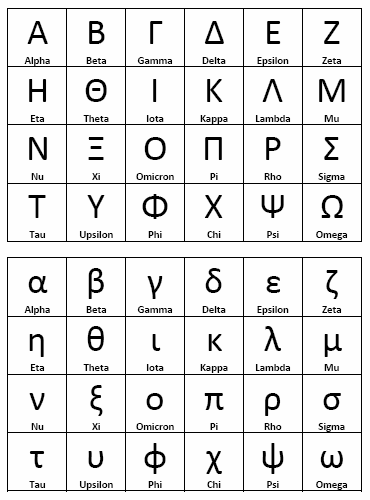 Unlike Phoenician (and other Semitic alphabets), the Greeks used letters to represent vowels, of which there are seven. The lowercase letters came much later. From the Greeks, the alphabet spread to the Romans and to the Slavs, with further adaptations. It is a sign of the prestigious place the Greeks have held in western culture that this alphabet makes occasional appearances today. Everyone is familiar with the American custom of naming university fraternities and honor societies after Greek letters. This practice dates from 1776, when the Phi Beta Kappa Society was founded at the College of William and Mary; ΦΒΚ stands for Φιλοσοφία Βίου Κυβερνήτης (pronounced “philosophia biou kybernetes”) which means “Philosophy, the helmsman of life.” I myself advise Reinhardt’s chapter of Phi Alpha Theta (ΦΑΘ), which stands for Φιλία Ανθρωπος Θεός, or “Love, humanity, God.” If you’re a biology major you can join Tri-Beta, and “seek the basis of life” (βλέπειν βασιον βίου). And so on. Fraternities and sororities are supposed to follow this custom, although what their letters stand for is secret and known only to initiates – or they may stand for nothing at all. I doubt that the names of any of the recently-founded Greek-letter societies at my own undergraduate college actually meant anything. But we continue to pay lip service to Learning! To know Greek was the mark of a university scholar in the nineteenth century, and their student societies reflected that (although I’m sure they did their share of drinking too). We don’t use hieroglyphics, or cuneiform, or Linear B. We don’t use Hebrew, Cyrillic, or Arabic. Greek means Learning! 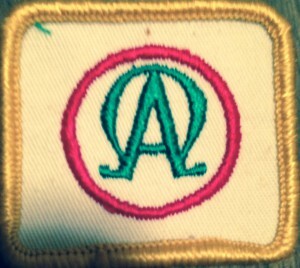 But Greek letters also appear in an ecclesiastical context. Although Jesus spoke Aramaic, the language of the early church, and its canonical texts, was Greek. Thus do we have Jesus referring to himself three times as the Alpha and Omega, the first and the last, the beginning and the end, in the book of Revelation. (I like to say that if he were speaking English, he might have said that he’s “A to Z”). Christians will occasionally use an interlaced alpha-omega symbol; here is one as it appears on the religion-in-life badge that I got when I was in Cubs. 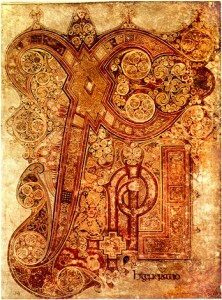 A long spear, overlaid with gold, to form the figure of the cross by means of a transverse bar laid over it. On the top of the whole was fixed a wreath of gold and precious stones; and within this, the symbol of the Saviour’s name, two letters indicating the name of Christ by means of its initial characters, the letter P being intersected by X in its centre… The emperor constantly made use of this sign of salvation as a safeguard against every adverse and hostile power, and commanded that others similar to it should be carried at the head of all his armies. But note that it’s not ex-pee! Generally if you’re using Greek, and you want full style points, you’ll want to use the letters that do not share the same form as their Latin equivalents, like xi or gamma, or don’t have Latin equivalents at all, like psi or theta. But watch out for the false friends eta, rho, chi, which share forms with Latin letters but do not indicate the same sounds. I bring this up because “Xmas” is a time-honored and completely legitimate abbreviation. It is not “Ex-mas”, as though we are trying to efface the name of Christ, but “Christmas.” Whether or not there really is a war Christmas, “Xmas” ain’t part of it.